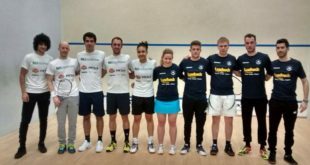 First match on the second court was the ladies, fifth string match between Vanessa Atkinson for Pontefract and Emma Beddoes for Nottingham. First game started steadily and evenly with Emma just behind on points but she then took the lead at 9/8, however Vanessa finished stronger to take the game 11/9. 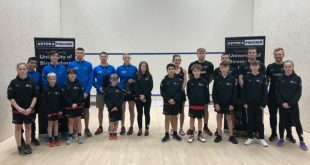 Emma started the stronger in the second, taking a 5/1 lead and holding on to the lead at 8/6, Vanessa then taking three points to lead 9/8, Emma levelled at 9/9 but Vanessa served out to take the game 11/9. In the third Emma again took an early 5/1 lead then with Vanessa visibly tiring she again held on to the lead slightly up to 8/6, Vanessa then levelled at 8/8 then at 9/9 but this time Emma served out to take the game 11/9. In the fourth Vanessa made a brave effort to stay in the match and took an early lead at 5/3, but Emma was determined and moved into the lead at 6/5, Vanessa levelled but again Emma stayed strong to lead 9/6, Vanessa scored 1 more point before Emma served out to take the game 11/7 and the match to a deciding game. With both ladies now showing signs of tiredness Emma stayed the stronger and held on to take the fifth 11/5 and the match 3 games to 2 after 46 minutes. 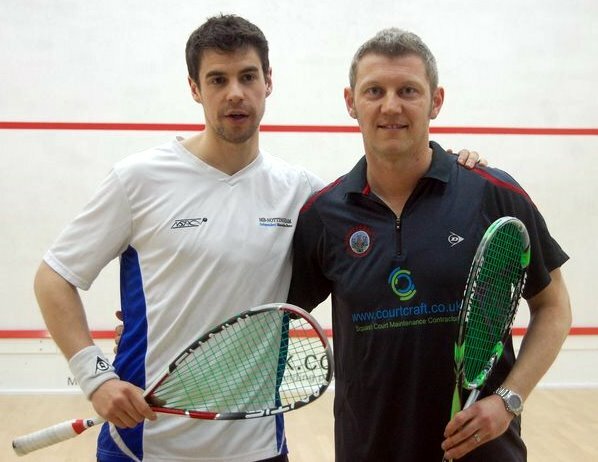 On the main court we had former World No 1 Lee Beachill for Pontefract facing young Lewis Walters for Nottingham. 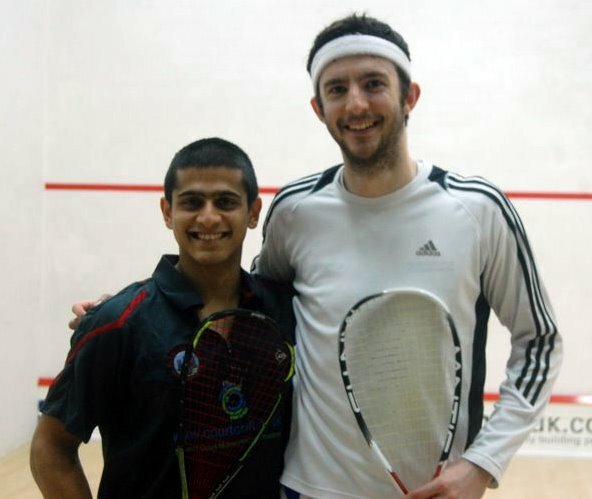 In the first two games Lewis played really well against the much more experienced Lee, but Lee took both games 11/9. 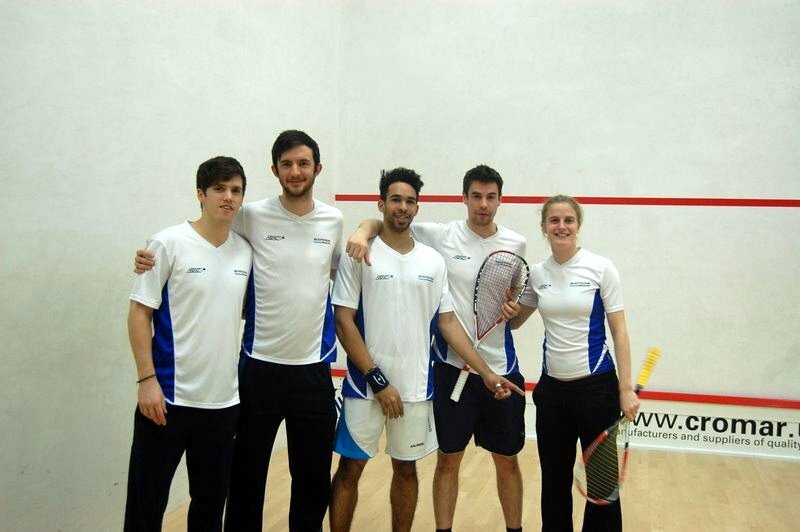 Then Lee started to tire and Lewis took great advantage of this to take the next two games 11/4 and 11/6. The deciding game was fought magnificently by both players and went to a tie break with Lee’s experience showing for him to take the game 12/10 and the match 3 games to 2. 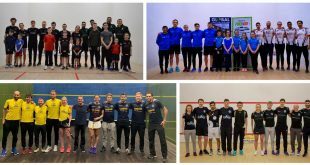 The next match on the second court brought up veteran Simon Parke for Pontefract against another youngster from Nottingham, Mark Fuller, and this turned out to be another five game match lasting 76 minutes. 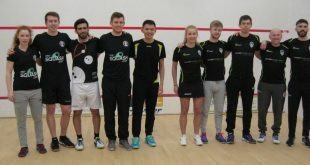 It went very much the same way as the previous match, with the experience of Simon showing through immediately and he took the first two games 11/5 and 11/3. 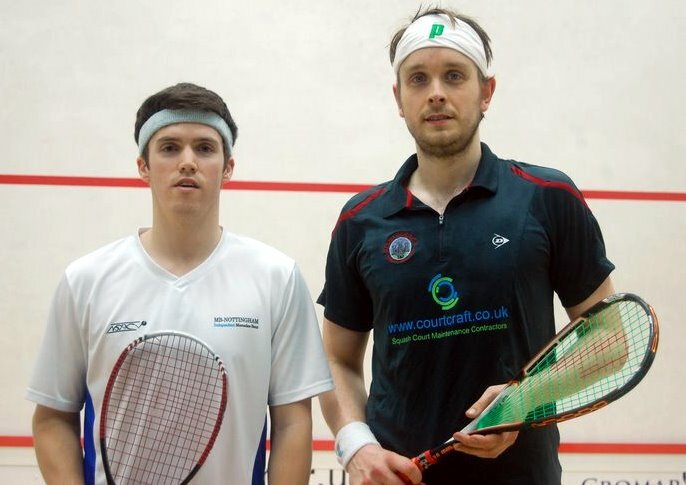 He then eased into a 5/2 lead in the third but then his old legs started to tire, and Mark took advantage to slowly get back into the game, getting to level at 8/8 and taking the game 11/9. 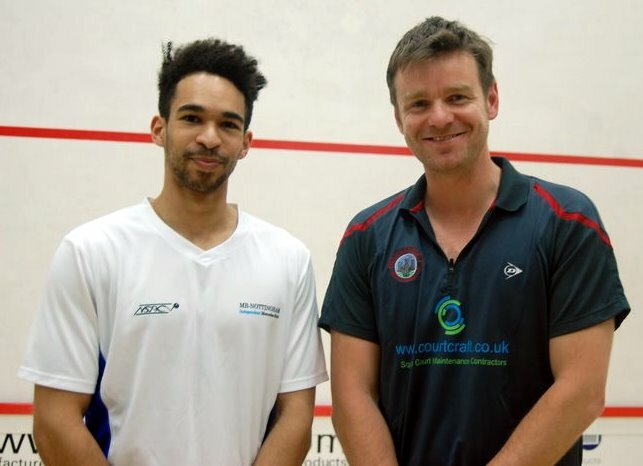 The fourth game was much closer, with Simon in his indomitable style chasing everything and got to level up at 7/7, but Mark again served out to take the game 11/8 and the match to a decider. The fifth game was played in excellent style, despite both players visibly tiring, and got to 5/5 before Mark eased in front to 8/7. 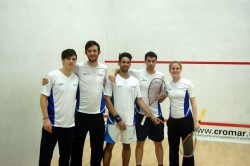 However, Simon used all his guile and experience to eventually take the game 11/8 and the match 3 games to 2. With Pontefract leading the tie at 2 – 1 and looking favourites, we moved back to the main court where we watched Pontefract seal the victory with two stunning wins by Saurav Ghosal and then James Willstrop in much quicker times against Nottingham’s Eddie Charlton and Chris Simpson respectively, Saurav winning 11/6, 11/4and 11/2, and James winning 11/4, 11/6 and 11/3. 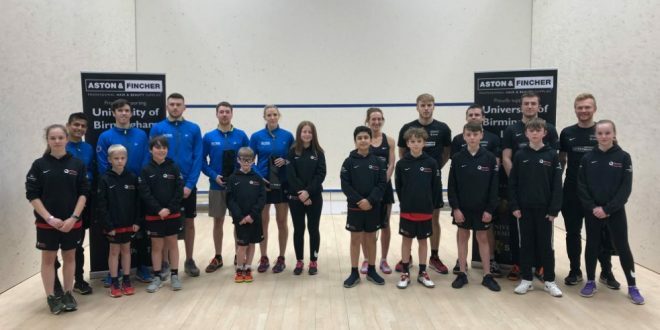 This result gives Duffield, who had no match tonight, the top spot in Group A, with one match still to play, against Pontefract at home in two weeks time, whilst Nottingham and Oxford join battle at Nottingham to decide the other semi final place. 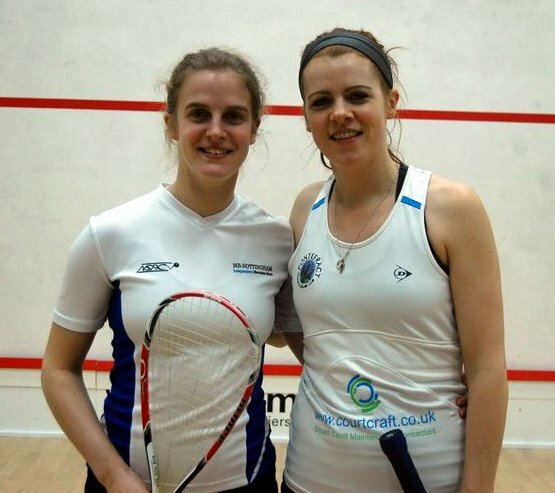 Vanessa Atkinson 2-3 Emma Beddoes 11/9, 11/9, 9/11, 7/11, 5/11. 46 mins.